I recently had the opportunity to see a film on the life of Sir Thomas More. 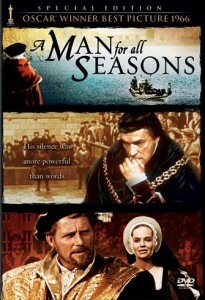 It was subtitled “A Man for all Seasons.” The film swept the Academy Awards when it was first released over forty years ago. It would be interesting to consider exactly why that subtitle was chosen. It may have been because of More’s varied career as a humanist and social critic, after all he was the author of Utopia, an idealized place that unfortunately does not exist as the word itself implies. Perhaps he was because of his role as a lawyer or a member of the English Parliament. Or even because he served as Lord Chancellor after the fall of Thomas Wolsey from King Henry’s favor because Wolsey failed to secure the Papal annulment of the King’s marriage to Catherine of Aragon. Certainly there is much to admire in the character of Sir Thomas More. From what we can learn from history, only Cardinal John Fisher and he were the only prominent persons who refused to consent that Henry’s divorce from Catherine was permissible. Both men paid with their lives for their convictions. When an individual is prepared to pay the ultimate price for his convictions, he certainly merits our respect. This is especially true in the case of More because other prominent individuals including Thomas Cromwell, Thomas Cranmer and others demonstrated a less pleasing moral flexibility on the issue. However, there is another aspect to the character of Sir Thomas More that we wish to discuss in this short essay on his life. It is not for the purpose of denigrating his character but to show another, and unfortunately less attractive, side to his personality. To do this, we must begin with the religious convictions that More held. At the time of his rise to influence, Henry VIII was King of England and Cardinal Thomas Wolsey combined the offices of Papal Legate and Lord Chancellor. The Church of England was in full communion with the Church of Roman and Popes Leo X, Adrian, and Clement VII were firmly in control. Thomas More was raised in the church and remained a faithful member of it all throughout his life. He was faithful in attending Mass at his parish church and sang in the choir according to some reports. He was even reported to wear a hair shirt under his clothing to aid in the mortification of his sins. There was no doubt that he considered himself to be a sinner and earnestly sought forgiveness. In his public person, nothing seemed to impede his rise in influence and power and his place in English society appeared secure. All of this changed, of course, when King Henry VIII sought to divorce his wife and marry Anne Bolyn. Before this time, Henry had proven to be a loyal son of the church and had even authored an attack on Luther’s view of the sacraments for which he received from the Pope the title of Defender of the Faith. It was reported that the true author of the King’s tract against Luther was Thomas More himself. In his zeal to defend the Church, More came to have almost a pathological enmity against anyone or anything that could be considered as attacking the church. He was more than a loyal son of the church, he considered himself a defender of the faith. Even the Bishop of London gave More permission to read works against the Church so that he could refute them. It is not our purpose in this short article to give a complete account of the life of Thomas More but to follow him in his self-designated role to defend the Church and its teachings at any cost. Thus true to his convictions regarding the church, he resigned his position as the Lord Chancellor when he could not agree with Henry’s determination to divorce Catherine of Aragon and break communion with the Church of Rome when the Pope refused to give him a bill of divorce. We will confine our remarks to the controversy that erupted between More and William Tyndale. It is apparent that early on More had heard of Tyndale and his efforts to translate the Bible. Although More himself was a humanist and capable of translating the Bible into English from the Greek original, he was convinced that it was a mistake to translate the Bible and make it accessible to the lay person. More would only go so far as to permit the New Testament to be printed as individual books and then parceled out to orthodox persons to read. No person would be permitted to own a complete copy of the New Testament in English; rather they would have to be content with individual portions. Exactly what More believed this would accomplish and what the result would be, no one is absolutely sure. However, there remains no doubt that More took a decided dislike to William Tyndale and his work of translation. However, Tyndale was outside of More’s direct control and the only way that More could reach Tyndale would be through the printed page. Thus More sought to silence Tyndale by attacking him in writing. More penned a confutation against William Tyndale. It is a tedious task to read his diatribe against Tyndale because it was written on the lowest level imaginable. More’s use of invective and coarseness brings little honor to the writer of the Utopia. Unfortunately Tyndale’s reply to More mirrors More’s book. There was charge and counter-charge and unfortunately the book does not rise above the level of More’s initial charge. More then answered Tyndale in a book that was nearly four times the length of Tyndale’s rebuttal to him. This book does even less honor to More than his initial blast against Tyndale. It is reported to contain nearly one million works, the majority of which were blast and counter-blast. Tyndale did not attempt to reply to this book. Perhaps there was some justification for Tyndale to reply to More in the manner that he did. Tyndale had forsaken his country, lived as a fugitive and his life was in danger. All of this he did so that the English people could have the Word of God in a language they could understand. More wrote from the security of his home, had a very comfortable lifestyle, demonstrated little or no understanding of Tyndale, and no concern for the plight of the people who were destitute of having God’s Word. It is no wonder that Tyndale would be aggrieved at one who showed contempt regarding his desire to translate the Word of God. The attitude toward the translation of the Word of God into the English languages brings into sharp relief the differences between the two men. In many ways they are alike. Both were true humanists, both were men of immense moral and physical courage based on firm convictions, and both paid with theirs lives for their convictions. Yet there was a great difference between the two men. More, from his privileged position in society, was unwilling to trust the “ploughboy” with the Word of God. Perhaps he feared that if the ploughboy read and understood the Scriptures, his beloved Church would be exposed for its failures to teach truly the Word of God. We probably will never know the exact reasons for his behavior. In contrast, Tyndale hazarded his life so that the ploughboy could have the Word of God in a language he could understand. Because of his confidence in the Scripture, he was convinced that the Church could be reformed of its errors and abuses. At the heart of the differences between the two men were two views of the Word of God. For More, the Word of God was the exclusive property of the Church and the Church could decide who would have access to it. As a result, More was convinced that the Church stood over the Word of God, the institution was the supreme authority in the Christian faith. For Tyndale, the Word of God was the gift of God to the people. It was God’s revelation in human language so that people, even the ploughboys of England, could have a more exact knowledge of God and His salvation than even the priests of the Church. In Tyndale’s estimation, the Word stood over the Church and the Scriptures were the supreme authority in the Christian faith. How thankful we should be for Tyndale and his view of the Word of God!